It is a very important story because it shows how all the comings and goings between our own world and the land of Narnia first began. When Digory Kirke and Polly Plummer are tricked by Digory’s peculiar Uncle Andrew into becoming part of an experiment, they set off on the adventure of a lifetime. What happens to the children when they touch Uncle Andrew’s magic rings is far beyond anything even the old magician could have imagined. 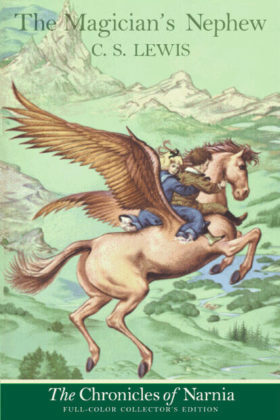 Book 6 in The Chronicles of Narnia series, fantasy for all ages.